" THANK YOU so much for my ring, it is beautiful and EXACTLY what I had in mind....I love it :) We are both very happy with the result and so grateful that you made it such a stress free and enjoyable process. We really appreciate the advice and patience. It was also such a surprise to receive it tonight, only a week after we met about the design! I really can't thank you enough! Will give you a call tomorrow to say thank you in person but I wanted to flick you a note now in case you see it. We look forward to meeting with again to arrange our wedding bands.
" So glad to have this finished, and the ring looks great! Thanks for your help with this, you've made the process wonderful and fulfilling. I won't hesitate to recommend you and Alluvium to my friends.
" I have had so many comments on it already, it is to die for, I absolutely love it! I’m sure you will be seeing more of my family in the very near future.
" Apologies for my late email. I just wanted to say thank you so very much for my stunningly beautiful ring. It’s gorgeous. I am counting down the days until our holiday so I can wear it! Hence the reason I had to give it back to you. Firstly my sincere apologies for the delay in contacting you however I have been away from the office until today. Hana just called us a short while ago over the moon with her new ring, thank you ever so much for arranging the reinstatement. It is great to know that we can always rely on you to do fabulous work – once again you are a star thank you ever so much!
" Yes!!!! 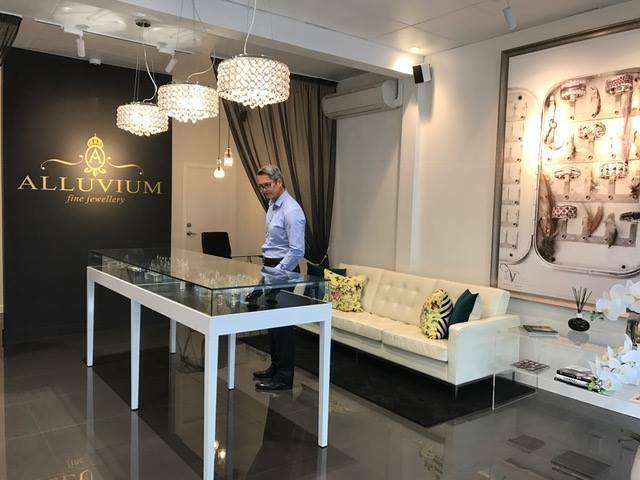 we are extremely happy with the outcome, Charles and the Team at Alluvium did a great job of it, and succeeded our expectation by far, Please give them a like and pop in to Alluvium, Charles will definitely help make a dream come true, he has for us.
" ring arrived and it looks amazing! size i think is good too...so fingers crossed.
" Just want to say thank you very much for the effort you put into getting the ring just right. It's much appreciated and the ring looks beautiful.
" It took Adam another couple of months to find another perfect moment to propose with the ring! And oh-it's stunning!! I absolutely love it!!! It's exactly what i wanted and am not going to change anything for now, until we decide on the wedding band. I remember talking about photographing the ring for your website and wondered if you still wanted to do that? Massive thank you once again!!
" Hi Charles, just wanted to let you know that I LOVE my ring - THANK YOU! ...it is absolutely stunning and gorgeous. just a quick note to state what a pleasure it has been to deal with you. Of course Christine fell in love with the piece, and much of the praise should go to Matthew on the creation of such a beautiful piece of jewellery, but your professionalism, dedication, flexibility and attention to detail made it a perfect experience. No doubt Christine will keep an eye on your displays, and we look forward to dealing with you again in the future. Wedding was AWESOME!!! - Thanks and we love the rings.
" Hi Charles the ring has arrived and is fantastic thanks you so much.
" Hi, the ring was a huge success. Thank you both so much for creating such an awesome piece. I gave Alice her ring last weekend and she loves it. Thank you for the photo and your phone call explaining things. I'm in Coromandel and loving my ring. Everyone who sees it admires its beauty. It's absolutely stunning! It by far exceeded my expectations!
" At Alluvium, you do not have to compromise on the quality of the rings due to budget! We had visited many jewellers and received numerous quotes for our rings. For the designs that we had in mind, the quotes were way out of our budget. I had almost given up on my original designs and went with a plain ring until my friend recommended me to talk to Charles at Alluvium. Charles is very customer-focused, friendly and professional. Most important of all, he is able to craft our rings using our original designs and the total costs were quite a bit less than our budget. The rings were custom designed, hand crafted and wax rings were made to ensure that we were happy with the designs before the crafting process begun. The rings were stunning and they exceeded my expectations. I am more than happy to recommend Alluvium to anyone!